Britain's Richard Whitehead smashed his own T42 200m world record as he reached Wednesday's final at the IPC Athletics World Championships in Doha. The 39-year-old powered through to win in 24.10 seconds, beating the 24.38 he set to win gold at London 2012. "I knew I was in great shape and I wanted to go out and deliver that performance," Whitehead told BBC Sport. Also through to the final is team-mate Dave Henson, who captained GB at last year's Invictus Games. Henson, a double amputee after stepping on an improvised explosive device in Afghanistan in 2011, finished third in his heat in 26.61 - just short of his personal best. 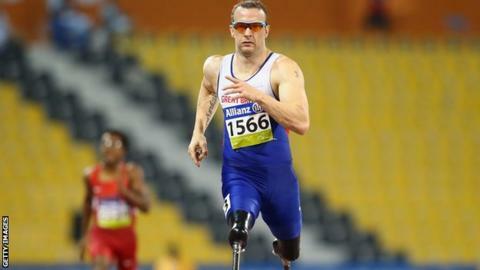 Whitehead had admitted he was disappointed at missing out on a medal in Sunday's T42 100m final, where he finished fourth. Although, as usual, he started slower than his rivals, he put in a devastating burst of speed over the second 100m of the race, finishing over a second clear of Australia's 100m champion Scott Reardon (25.27). "It is such an honour to be a GB athlete and putting on the team kit, even at 39," added Whitehead, who also revealed that he had missed his young son Andrew, who is at home in Nottingham, crawling for the first time. "It is about acting on all of the support I have had over the past 12 months. I enjoy what I am do and am passionate about what I do. "It is now about delivering another performance in the final. Anything less than a world record isn't good enough for me - I need to keep pushing and pushing. It is important that people realise that sport isn't about medals for me - it is about giving back to those who have supported me and hopefully guiding other people to their success." Meanwhile, Jo Butterfield added discus bronze to the gold she won in the club throw on Saturday for Britain's only medal of the day. Butterfield managed a best of 8.96m with gold going to American Rachel Morrison in a new world record of 12.86m. But the 36-year-old was still thrilled with her performance in her weaker event. "I'm over the moon - I knew that one was going to be really tough and I had to work hard for it," she said afterwards. "It was a European record; not quite my personal best but I'm happy."